Festooning a six foot privacy with marbles is addictive fun that really adds a pop and punch to the garden setting, especially when the sun hits it from the back. The process is pretty simple. I would recommend using new marbles. Vintage marbles will vary in size, slightly, so it you can deal with this, go ahead. So first, find your marbles if you’ve lost them, then determine a drill bit size that will bore a hole, ever so slightly smaller than your marble. You want it to press in snugly to help it stay put. No adhesive needed. I advise drilling test holes in scrap wood to help you get the right sized holes made. You made need to purchase a special sized bit. Then go to town. Create a meandering pattern of holes on your fence. Think constellations of stars for inspiration. 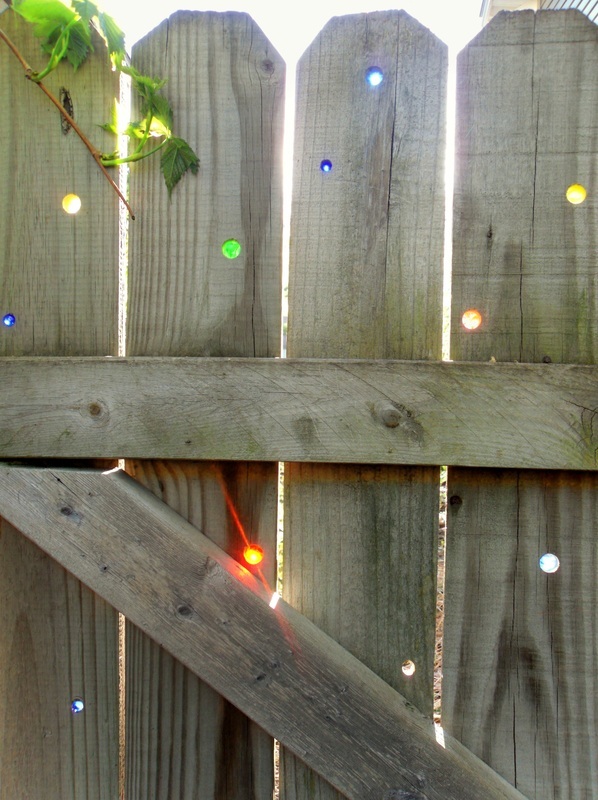 A gate is a great place to begin, but anywhere you can drill will benefit from the little glimmers of colorful light. I lose a marble or two over the winter from the wood contracting and expanding and maybe a couple over the summer, but a little vigilance, popping them back in is all that’s needed. Beware though, once you get going on this one, you will want to be be-dazzling your entire fence. Have fun!